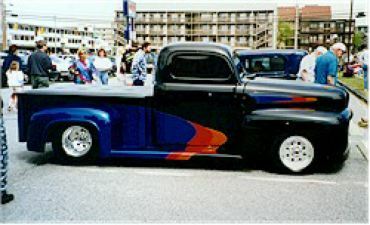 I'm am going to deviate from the usual topic of this site to talk about the strange hobby of truck customization. Now most of the time, its ok. It might make a car look original and different, or add that feel that the driver wants from his vehicle, but sometimes it can be taken too far. Just look at some of the examples. If you want to see a barrel full of laughs, just look at the bottom shelf of the magazine rack at you local book store. Check between "Guns and Ammo," and "Soldier of Fortune." 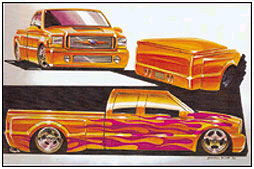 There you will find a delightful piece called "Street Trucks Magazine." This publication first brought the concept to my mind. After all, I foolishly thought that trucks were purely utilitarian, and that to buy one meant that you would use it as designed. This is, of course, unless the truck is a classic, in that case you keep it really nice and take good care of it. I seem to have been wrong. Some people seem to use their trucks as canvases on which to spread their artful tackiness. While the blue fuzzy dice, dancing hoola girl, and head bobbing dog in my car don't scream "class," at least those items are temporary, and don't damage the car. They don't make the poor thing loose its undercarriage when it goes over a speed bump. You can't honestly say that the trucks featured here are in better condition than when they were bought. If I were a truck I'd rather lie helplessly in a ditch, collecting rust and grass than be submitted to the sadistic torture the poor vehicles are suffering. Many "Street Truckers" claim to know exactly what they are doing when they modify a vehicle like this. Let me ask you, do they know more than the engineers that spent years designing the vehicle? Can a hobbyist "improve" in a week or two what skilled designers and researchers took months to plan? I don't think so. The bumper skirts, fenders, etc. on this quasi-Siverado seem to be level with the the the bottoms of the tires. Most half-way competent people understand how that just won't work. I think that just shows the caliber of genius that Street Trucks Magazine employs. 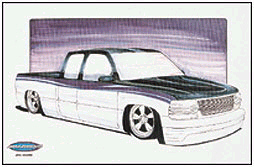 Street Trucks Magazine boasts that this design sports a V-10 engine. I can see how you would need something that powerful to make up for the friction caused by the bottom suface area of the "vehicle" dragging on the ground. Now, don't get me wrong, I don't mind people customizing or restoring a car or truck, just as long as it's tasteful. See the link below for an example of a tasteful restoration on a '47 Chevy Coupe. These trucks have left the world of "Sport Utility Vehicle" and entered the acursed relm of "Stricly Urban Vehicle" That doesn't mean, however, that it isn't exciting to drive, I mean you still have to navigate around deadly (to the truck at least) speed bumps and trek through parking lot jungles. You have to walk, though, because you left the drive shaft, transmission, and axles at the speed bump you didn't see. It's hard to tell, but this mangled Mazda's graphics package features the logo "JVC" on the side. They must have made his VCR. I took these pictures from the "Pro Street Trucks" website. I wonder how one becomes a professional at street trucking. If you own one of these pictures and wish for me to take it down, Email me and I will promptly remove it.